Prior to graduating from recruit training, new Marines from Charlie Company participate in one last physical fitness session known as the Motivational Run. During this formation run, friends and family witness the transformation their loved ones underwent during the 13 weeks of recruit training. Congratulations, Marines. —Marine Corps photos by Sgt. Benjamin E. Woodle. October, 1, 2015. MCRD San Diego. All graduating recruits run a 4-mile course which passes by all four training battalions, plus Support Battalion. At each battalion, selected recruits ring each of the Battalion Bells as the rest of the Company runs by singing cadence, loudly signaling successful completion of Recruit Training. As recruits run to the cadence of their Drill Instructors, parents, family members and friends line the streets and cheer as they try to find the face of their loved one among the crowd of new Marines. The brand new Marines are given on-base liberty during the day so they can spend time with their families, introduce them to their fellow new Marines and drill instructors, show them the barracks, training areas, parade decks, and other areas where they trained, demonstrate proper liberty behavior, and most of all to share with their families their own personal stories about their transformation from civilian to Marine. This is perhaps the best day to be had at MCRD. To bare witness to the transformation of your Marine from when you first departed ways until the moment you are reunited at liberty call, is truly unforgettable. Above information found on the Parris Island web site, October, 2009. Below you will find some important advice for families and friends spending Family Day with new Marines. When it's time for your new Marine to go, this is what "Gunny Says..."
If you want to see the demons come out of the drill instructors, let your Marine be one minute late for accountability. He WILL get blasted, recruit style, in front of every family member on the Depot. Don't be the person begging your new Marine "just one minute more" and getting him in trouble. I don't care if you're sitting in the parking lot across from the AWTF (All Weather Training Facility). When he says he needs to leave, that means he needs to leave and get with his platoon. 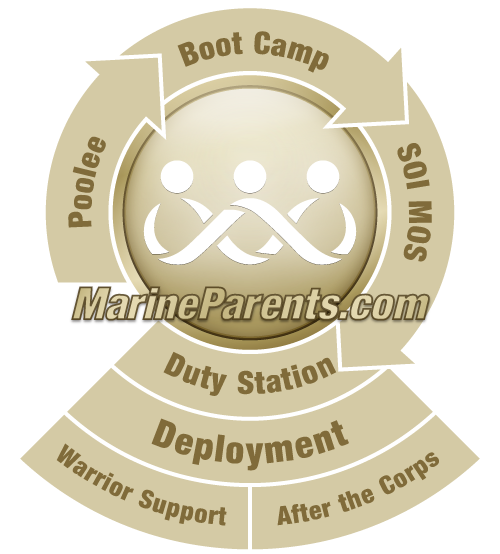 The EGA Shop has battalion-specific items to support your recruit in boot camp and for their graduation and the moto run. Every purchase supports our troops at EGAshop.com, because 100% of the proceeds benefit the outreach programs of MarineParents.com, Inc. Click here to shop! I remember when I spotted my son running in his little shorts - he was embarrassed when I yelled out his name. During the ceremony everyone looked the same and my daughter had to point him out to me. Such a proud moment - tearing up just thinking about it. It was December 8, 2006. —Laurie G., Marine Mom, New York.